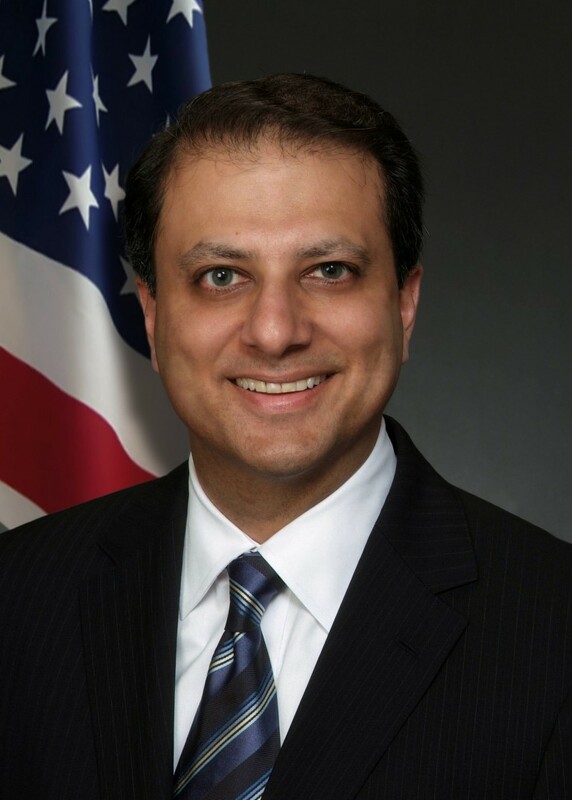 An indictment charging nearly four-dozen leaders, members, and associates of several organized crime families, including at least two borough residents, with wide-ranging racketeering offenses was unsealed last week in federal court, according to Manhattan U.S. Attorney Preet Bharara. The 32-page indictment charges 46 defendants for their alleged roles in a long-running racketeering conspiracy composed of leaders, members, and associates of the Genovese, Gambino, Lucchese, Bonanno, and Philadelphia families of La Cosa Nostra, who worked together to engage in criminal activities throughout the East Coast between Springfield, Mass., and Southern Florida, Bharara said. Thirty-nine of those charged were taken into custody last Thursday. During the arrests, law enforcement officers recovered, among other items, three handguns, a shotgun, gambling paraphernalia, and more than $30,000 in cash, the U.S. Attorney noted. The suspects are charged with racketeering conspiracy, arson, illegal trafficking in firearms, and conspiracy to commit assault in aid of racketeering. Among those taken into custody last week were Queens residents Frank Barbone, 44, and Israel Torres, 66. According to the indictment, the suspects have been involved in gambling, extortionate collection of loans, other extortion activities, arson, conspiracies to commit assaults in aid of racketeering, trafficking in unstamped and cigarettes, gun trafficking, access device fraud, and healthcare fraud for several years. To protect and expand business and criminal operations, as alleged in the indictment, members and associates assaulted, threatened to assault, and destroyed the property of people who engaged in activity that jeopardized: the power and criminal activities of the organization and the power and criminal activities of their respective LCN families; the power of leaders of the organization; and the flow of criminal proceeds to the leaders of the organization. Members and associates promoted a climate of fear in the community through threats of economic harm and violence, as well as actual violence, including assault and arson. Members and associates of the organization at times engaged in criminal conduct or coordinated their criminal activities with leaders, members, and associates of their respective LCN families. At other times, members and associates of the organization met with leaders, members, and associates of their respective LCN families to resolve disputes over their criminal activities. And in order to avoid law enforcement scrutiny, members and associates conducted meetings surreptitiously, typically using coded language to make arrangements for meetings, and meeting at rest stops along highways and at restaurants, according to the indictment.